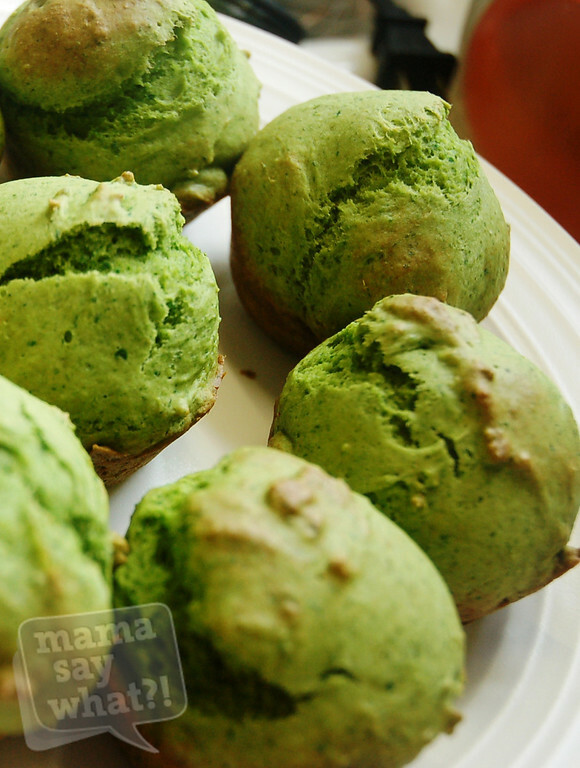 Spinach Muffins Recipe Mama Say What?! | Mama Say What?! From talking to many other mamas, it seems that most babies and toddlers go through their own picky eating phases. My own little guy certainly does! Some days he’ll eat veggies very willingly and other days, you’d think we were trying to poison him. So I have to result to being sneaky! 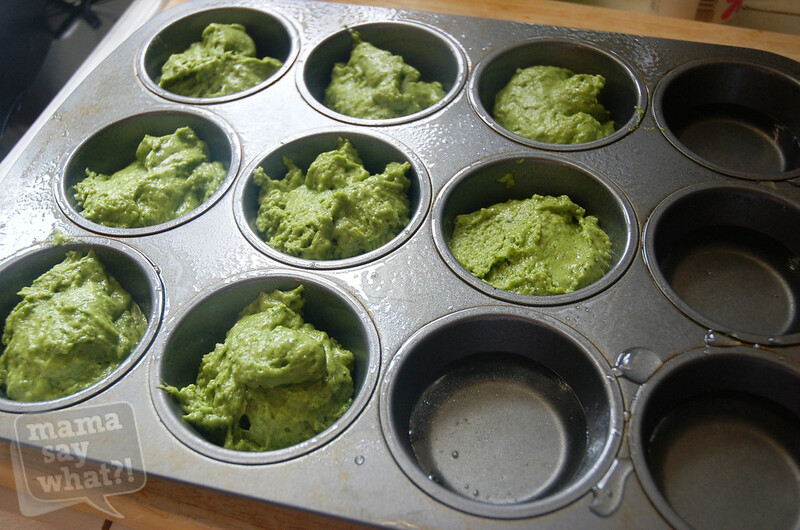 One of our little guy’s favorite veggie snacks are Spinach Muffins – I make them often (whenever I have fresh spinach to use up) and store them in the freezer. They’re quite healthy, too —on top of the added veggies! They’re made with applesauce and very little sugar and oil. I originally found this recipe here. They’ve been a hit at playgroups as well. I have them myself every so often, so they’re not just for the little ones. 2. 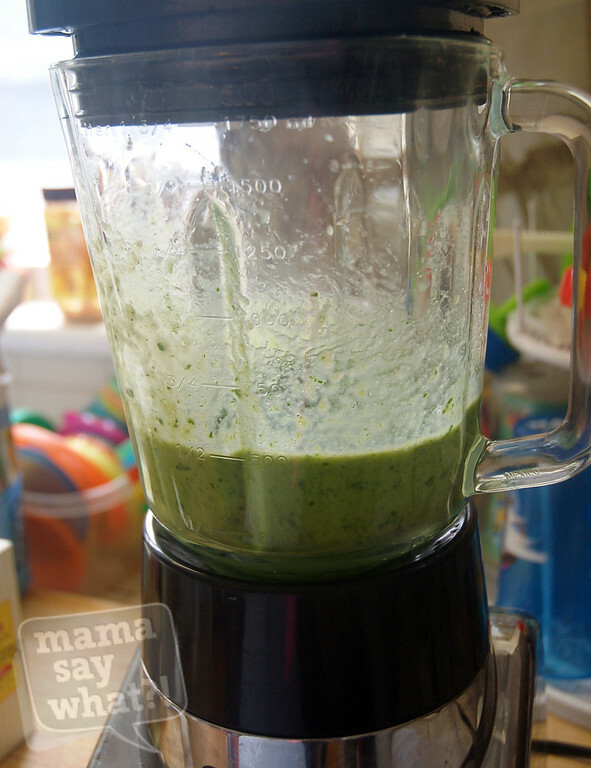 Put the first six ingredients (applesauce, egg, vanilla, spinach, sugar and oil) in a blender or food processor and blend. Pour the mixture into a large mixing bowl. 3. 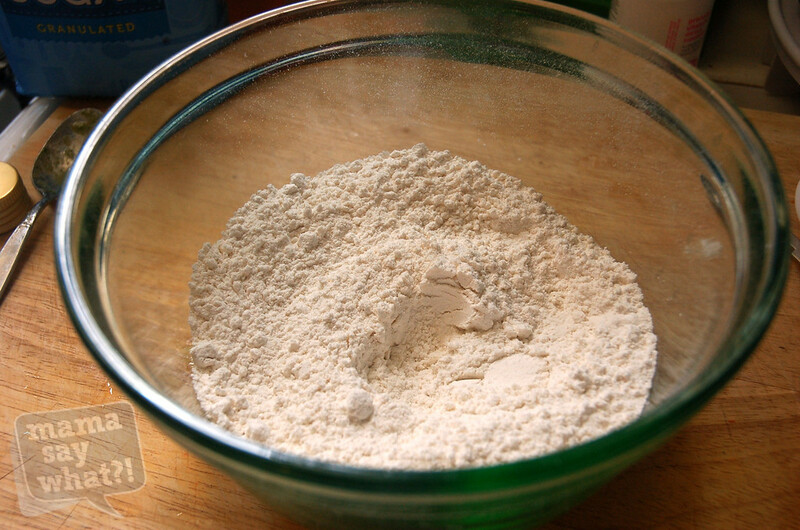 Combine the dry ingredients (flour, baking powder, baking soda and salt) in a smaller mixing bowl. 4. 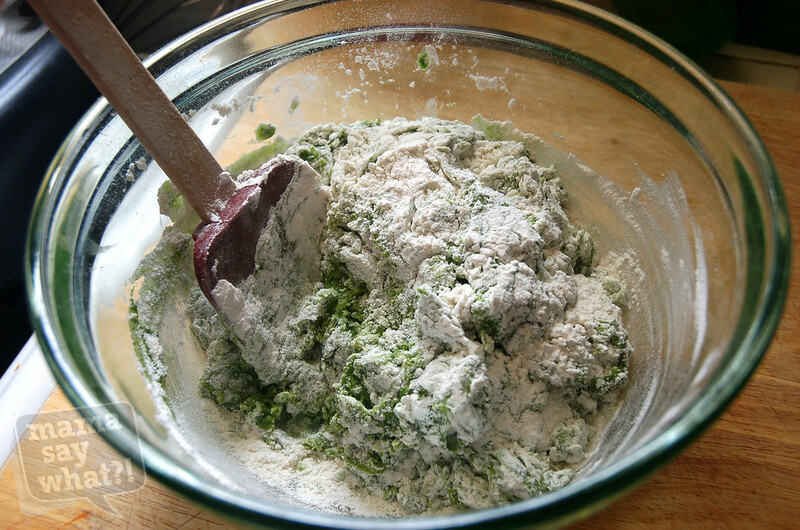 Add the wet spinach mixture to the dry ingredients. 5. 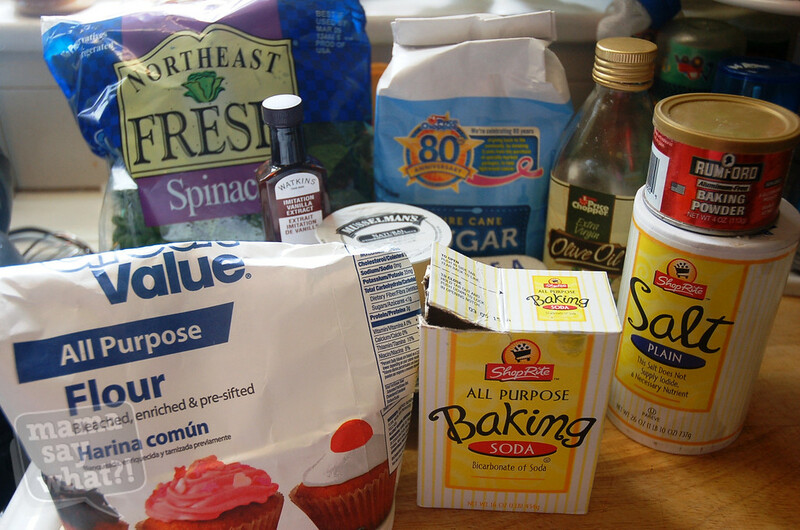 Slowly mix the dry ingredients into the wet until combined. You can use a spoon or spatula. The mixture will be very dense! On occasion, if it seems too dense, I’ll add a splash of milk to loosen it up, but the mixture should resemble a thick cookie dough. It won’t pour easily. 6. Scoop the batter into greased muffins tins. I like to make regular-sized muffins but you can also use this batter to make mini-muffins. This recipe will make 8-9 large muffins or 24 mini-muffins. 7. Bake at 350 degrees for 12 minutes for mini-muffins or 17 minutes for regular-sized muffins. I like to set my timer a few minutes shy and check them so they’re not overdone. 8. Let them cool on a rack and enjoy! As I mentioned above, I like to keep ours in the freezer and take one out when needed. What are some ways you sneak veggies into your little one’s food? Added by MaryEllen M. on April 5, 2013. These look great! Have you tried them with honey instead of sugar? I started making banana bread with honey and applesauce and omitting oil and sugar and it has worked out great- I wonder if I could do the same with these muffins? 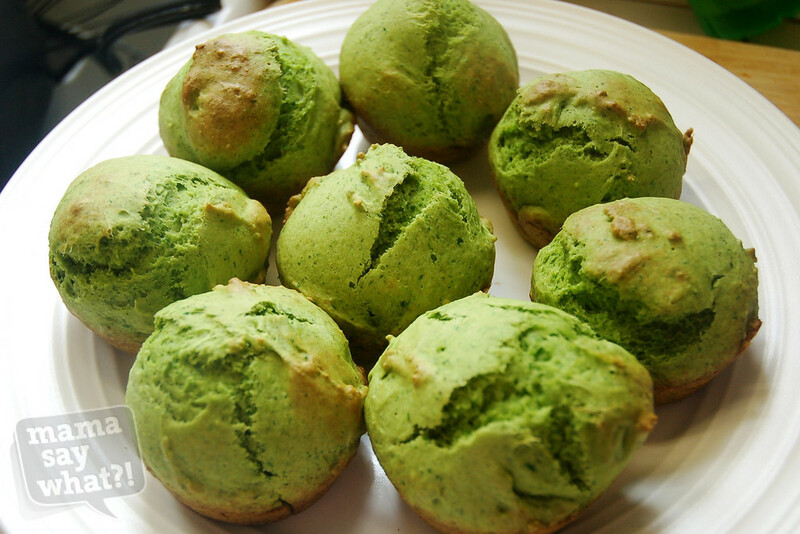 Those are some GREEN muffins! They sound yummy! I doubled the recipe and added some carrots and kale. Yum! Thanks for the recipe. Wow! This seems easy enough!? Seem like a great way to get veggies to myself! I’m a carb fan so my husband is always looking for ways to get more veggies in my own diet. he would love this! Thanks! Pingback: Hidden Veggie Recipes Mama Say What?! | Mama Say What?! I made these last night and they were great! both kids loved them. Instead of sugar I added a few Tbsp of honey and some dates for sweetness. I’ll try this again with kale. Thanks for the recipie! Shannon, I’m not sure! I’ve never used frozen. I hope you’ll chime in and let us know if you did and how it came out. Looks good! What about banana in lieu of applesauce? Made loafs with these, and added chocolate chips (was craving chocolate, figured it was portion control!) and baby spinach. They turned out fantastic, and it’s a super fast recipe, so I’ll definitely be adding it to my meal prep routine! I used frozen spinach and it worked well! I’m assuming you thawed the spinach first? Hi Donna – I’ve never used coconut flour in this recipe (though I have in others and I know the consistency can be different). If you try it please let us know how it comes out! Should the consistency be more like a biscuit? Mine was so if it shouldn’t be what did I do wrong? 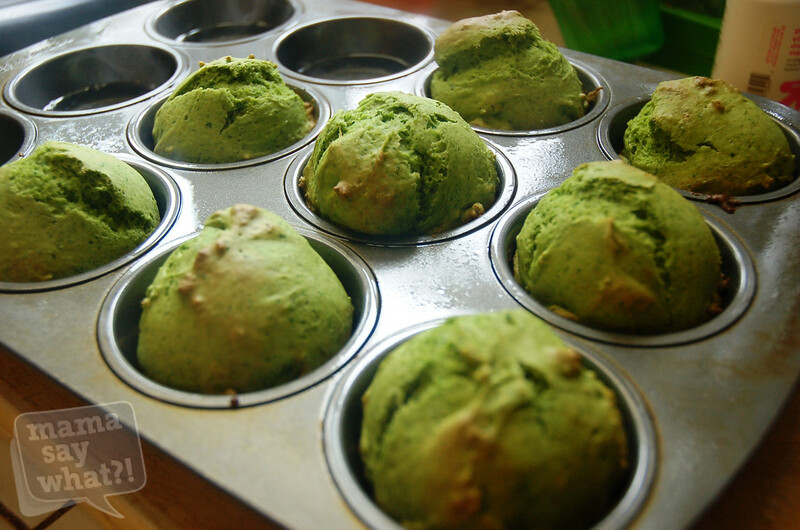 Hi Michele – they are definitely thicker than a typical muffin batter (but still come out great!) If they are more like biscuits, I’d add a couple more TBS of milk or liquid to thin them out a little. But yes, they are quite thick. How do you recommend defrosting the muffins once they are frozen? These were awesome! I didn’t have any regular applesauce on hand (*gasp* I always do for baking), so I used some of my son’s special strawberry applesauce. I cut the sugar in half because the applesauce was sweet. I also used 1/4c wheat flour and 1 1/4 white to make it healthier (would that do anything? It makes me think it’s healther). Maybe I’d do 1/2c and 1c next time. Definitely a keeper! Thanks! Great for St. Patrick’s Day! Going to give these a try. Thanks! Has anyone tried Stevia in place of sugar??? Results?? Can u use frozen spinach?